Central India tour packages offer golden opportunity to explore rich history, beautiful historical monuments, rich cultural heritage, tigers-infested wildlife sanctuaries, tribes & pilgrimages. Three prominent historical tourist destinations of Madhya Pradesh – Gwalior, Orchha & Khajuraho – are located at the very edge of north India, therefore, many North India Tour Packages comprise them into longer duration north india tour itineraries. The contiguous states of Madhya Pradesh and Chhattisgarh and their adjoining regions collectively form Central India. Madhya Pradesh, with its diverse wildlife, rich heritage, splendid architecture, pilgrimage sites, magnificent monuments and exquisite landscape, covers a major portion of Central India. The region can also be termed as ‘visions of bygone empires’. The Central India has been one of the world’s earliest and most highly developed civilizations. The area, known to history as Malwa, preserves thousands of monuments testifying to the glory of its past, while the vast tracts of unexplored forests hide big game and aboriginal tribes. Physically, Madhya Pradesh & Chhattisgarh are plateau. Their scenery is varied by the Narmada and Tapti rivers — rushing torrents during the monsoon — and the Vindhya and Satpura mountain ranges. Legend has it that Vindhya strove to compete with Himalaya but was forced to take second place. The population is overwhelmingly Hindu and the language is Hindi. It is the land of the tribes - Gonds and Bhils - who still make up one-seventh of the population of Madhya Pradesh & Chhattisgarh. There are now two kinds of Bhils; the farming ones, and, to coin a phrase, the Hill-Bhils. The rich forests, covering fully a third of the two states, produce the country’s best quality teak wood and the rich black soil yields cotton, rice, wheat and sugar cane. Beneath the earth’s surface are other riches whose industrial possibilities are being utilized. One can read the history of the Central India in its monuments. Seemingly here, more than anywhere else in India, every epoch was accompanied by an outburst of architectural magnificence well-nigh unequaled in all of human history. A Central India tour offers great opportunity to visit great heritage - from the prehistoric site of Bhimbetka to ancient Hindu and Buddhist monuments at Khajuraho, Orchha, and Sanchi. Most travelers head straight for Sanchi, famed for its ancient Buddhist stupas (funeral mounds) aixl artistically carved gateways. Murals in the rock-cut caves at Bagh are the best specimens of early Indian painting after those of Ajanta. The Sultans of Mandu were great builders and you can admire in this curiously situated ghost city, some of the finest specimens of Pathan (Afghan) architecture. Bhopal, Ujjain and Indore have a few outstanding Hindu, Muslim and Jain monuments. One of the best scenic spots in India, the Bheda Ghat (famous for marble rocks), brilliantly shining white cliffs, border the Narmada River near Jabalpur. Sevagram, the "village of service", not far from Nagpur, symbolizes the Gandhian way of life and has grown into a hallowed place of pilgrimage. Bandhavgarh National Park and Kanha National Park are famous tiger reserves in Madhya Pradesh. Religious towns of Maheshwar, Omkareshwar and Amarkantak attract a large cache of Hindu pilgrims. The records in stone go back to the great Ashoka who ruled over the Maurya Empire and laid the foundation of the great stupa at Sanchi. His empire collapsed shortly after his death and the Shungas took over, followed by the resplendent Guptas whose reign (300--500) is appropriately known as the Golden Age. The repeated invasions of the Huns triumphed over the splendor of the Guptas’ Empire, but the Huns in turn were defeated by the famous Hindu emperor Harshavardhan, who put 60,000 war elephants and 100,000 horses on the battlefields to achieve his conquest. Every five years, Harshavardhan distributed to the poor all the riches he had accumulated and during one of these years of generosity he was reduced to begging a cloak for himself. He showed similar generosity at Kumbh Mela held in Prayagraj (Allahabad). In 10th century emerged the Parmara dynasty and their great and learned king Bhoja. 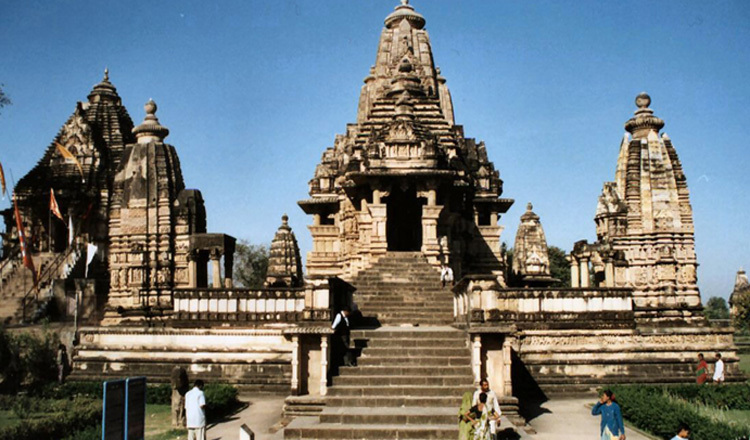 The succeeding Chandelas are now remembered for their temples of Khajuraho. The first Muslim invasions in the 11th century ushered in a four-hundred-year period of constant skirmishes between Muslims and Hindus — the latter reasserting themselves every time the Delhi Sultanate showed weakness. Often the stake of the battle was the fabled city of Mandu. Though the fanatical Mughal ruler Aurangzeb (1658-1707), managed to extend the territorial boundary, but at such tremendous financial cost that the structure collapsed after his death. The Marathas, who had started life as peasants, skilled in guerrilla warfare, reigned over Malwa until the advent of the British at the close of the 18th century.